The other day, I found myself daydreaming (as I often do) about the weekend Nick, I, and the dogs spent at the beach. We had gathered together with some friends to celebrate the birthday of someone very dear to us. While, ideally, the weekend should have been about her – it somehow manifested into a period of time that allowed me to witness the stillness in myself. Maybe you think I talk about ‘slowing down’ and ‘stillness’ and periods for ‘breath’ a lot. I do. It’s because I am a person who conducts their life at warp speed. ‘Stillness’, when I get to experience it, is rare and matchless. There were two periods during that weekend that made me feel as if I had been swaddled by the cloud-like embrace of calm. One morning, we rose early. We strapped the dogs into their leashes after their breakfast and we made the quiet, groggy shuffle towards the beach. The sun had yet to rise and we meant to catch it in its glorious beginning. Nick had come equipped with his camera and I was the designated dog handler. I didn’t mind. I had taken off my shoes and scrunched my toes in the millions of grains of sand with each step that I took. 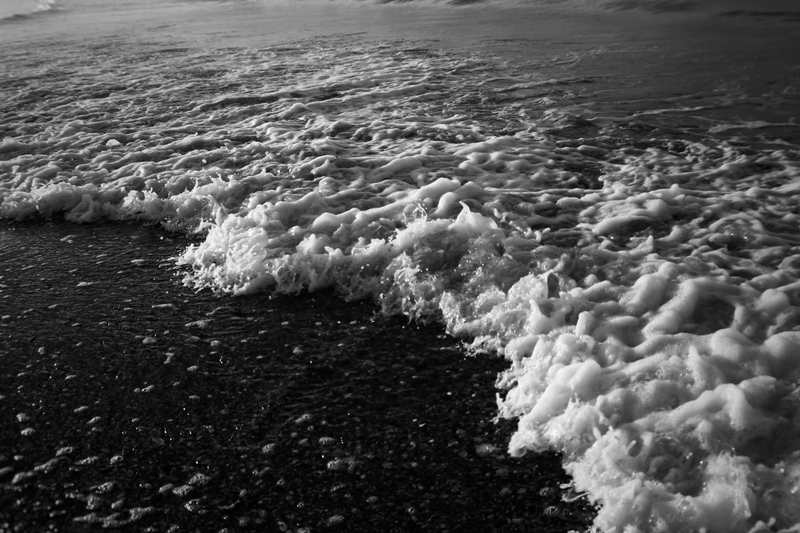 I occasionally hazarded to moisten my feet with the approaching sea water that made the most sensational whooooosh sound as it rushed onto the beach. To be honest, I was too lost. 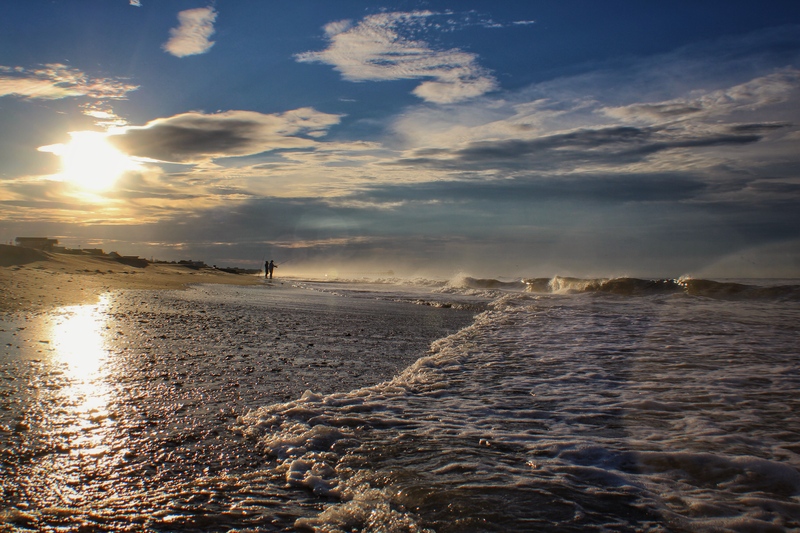 I was so immersed in the sensory pleasures of being on the beach while there were no other occupants that I missed when the sun had breached the clouds above us. As the light peaked through, I had already disintegrated into sea foam and had washed away with the outgoing water. 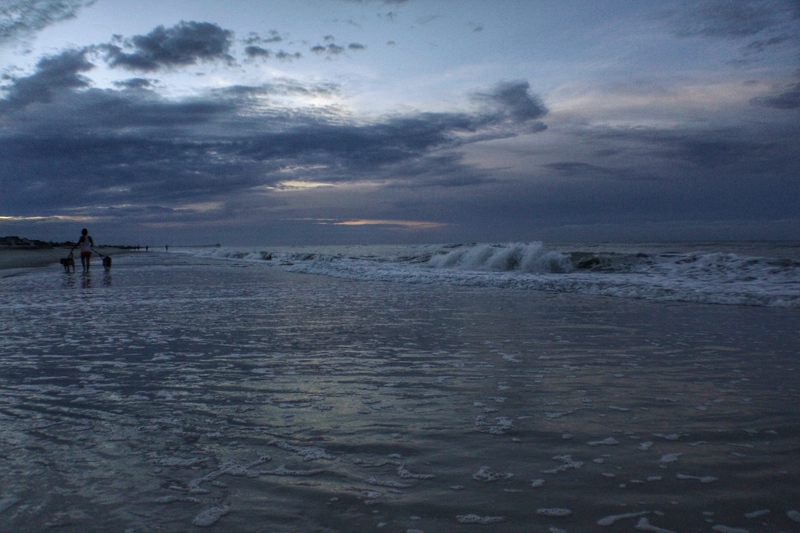 The second period, which will forever find its way into my dreams, is a particular night spent on the shore. It was the last night we would be at the beach and we had congregated to have an informal dinner of chili and rice and then to go down to the beach. Once it was time to venture towards the beach, we leashed the dogs once again and prepared them for their adventure. Bless them for always being willing. The night was cool and became even more so the closer we got to the water. The wind whipped at us slightly. The beach was silent – only dotted by one or two small groups of people and the slight blur of faraway lights at the pier. As we walked on the beach, the surge of excitement overwhelmed me. A friend had taken one of our dogs and sprinted off with him in a swell of energy. Without a second thought, I darted after him. I felt my heart beat loudly in my ears, my bare feet were pounding heavily onto the sand, and my thin dress pressed against my body as the wind rushed at me from all sides. I had gone so far and was on the verge of wheezing but I needed more. I raced back towards my group of friends and nearly tackled Nick with my momentum. I screeched with laughter and pushed my tangled, wind-blown tresses out of my face. Nick chuckled at my exuberance. Then – as we turned to look out onto the water, we saw in the distance a huge, ominous cloud that hung over the open sea. In its hazy interior, we saw the brilliant flash of lightning illuminate the obsidian backdrop of the earth. We witnessed the sharp tendrils of lightning break from the clouds and pierce the sky. I felt my skin prickle and my vision blur and focus all at once. My breath caught and my body felt warm. I reached my arm out towards the looming storm over the ocean – as if I would somehow be able to touch it. Nick and I departed from our group and we finished our night out on the beach sitting serenely in the sand with our beloved dogs next to us and watched the clouds shift and mutate with the wind. I still remember the feeling of placing my arm around on my dog’s furry torso as we surveyed the push and pull of the moon’s influence on that vast sea. Here’s what I’ve been shoveling into my mouth lately! 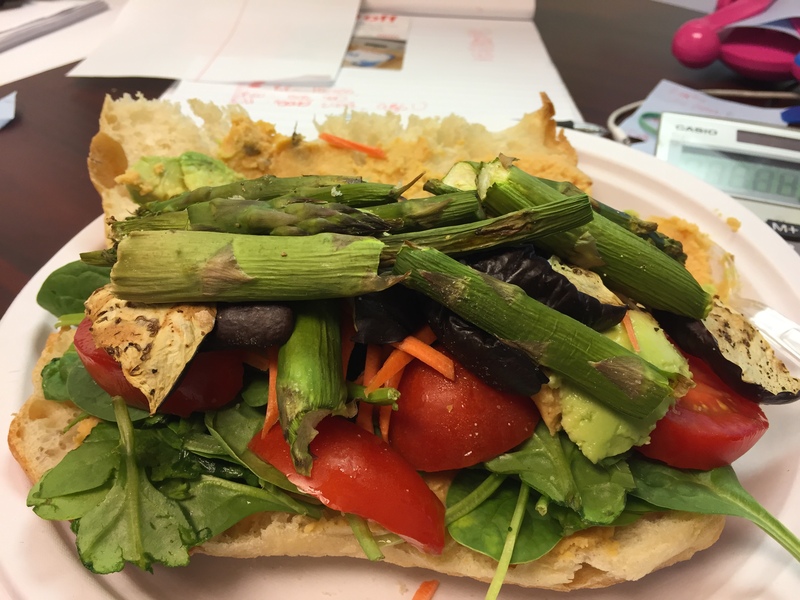 The most intense veggie sandwich – roasted asparagus, roasted eggplant, tomatoes, spinach, avocados and leftover buffalo cauliflower dip as a spread. All on foccacia. Eggplant Parmesan! I asked for it without the cheese so I could put vegan cheese on it when I got home. THESE ARE THE BEST CHIPS! And – no actual meat-related products! 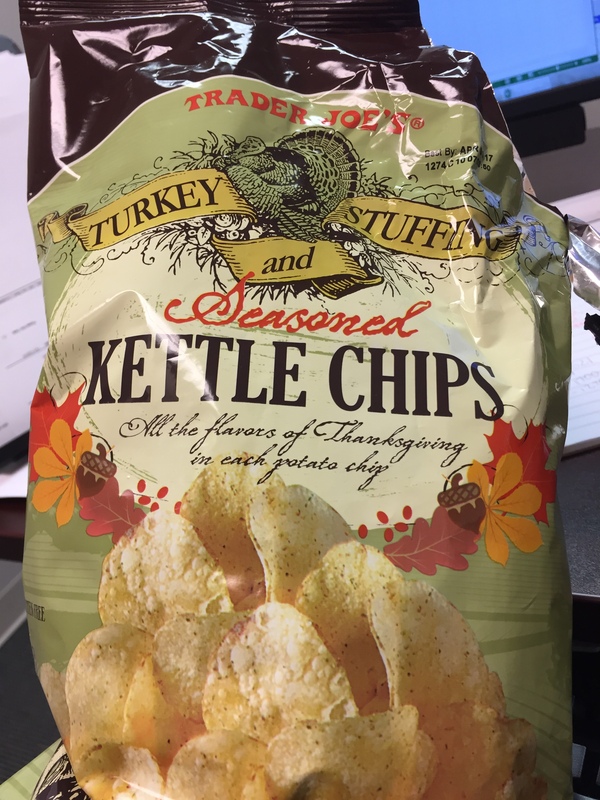 No chicken or turkey flavoring! 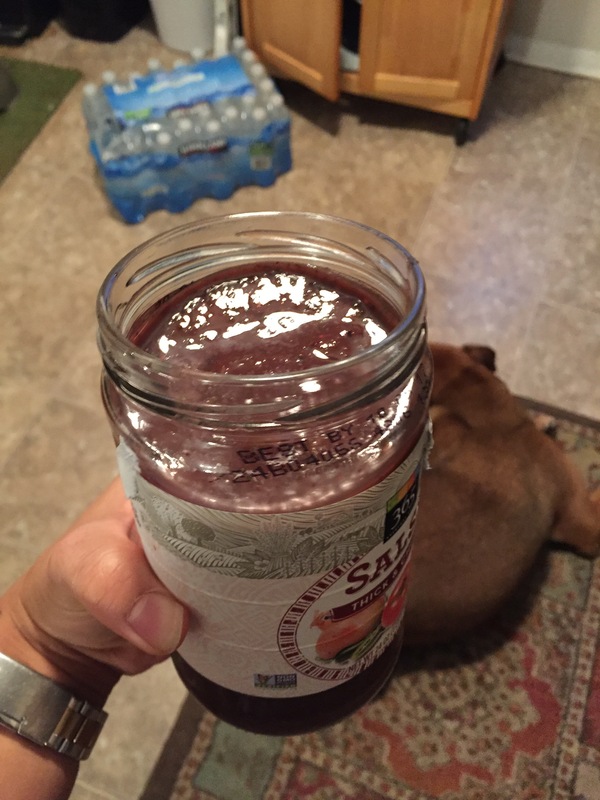 My standard recycled-jar smoothie containing acai juice, mixed berries, spinach, banana, and hemp seeds. 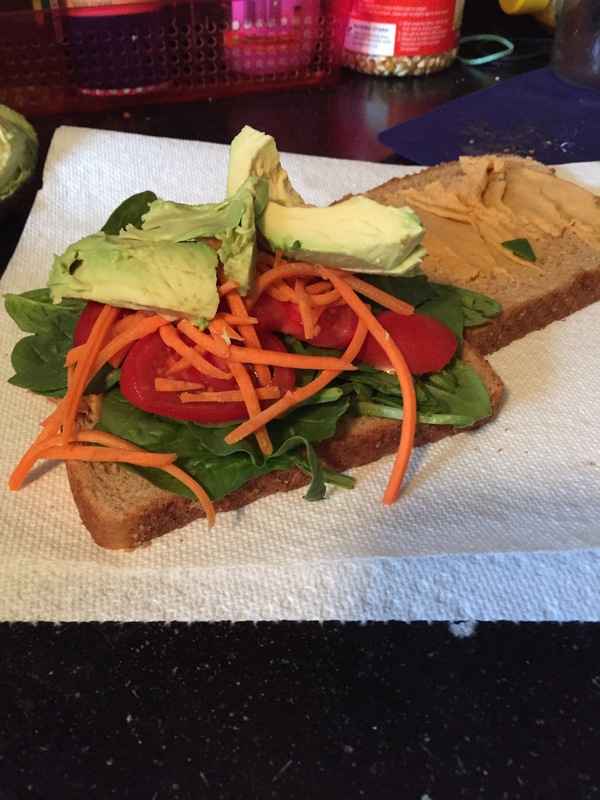 Another awesome veggie sandwich wrapped in a paper towel so I can eat on my way to work! Avocado, carrots, tomatoes, spinach, and leftover buffalo cauliflower dip. 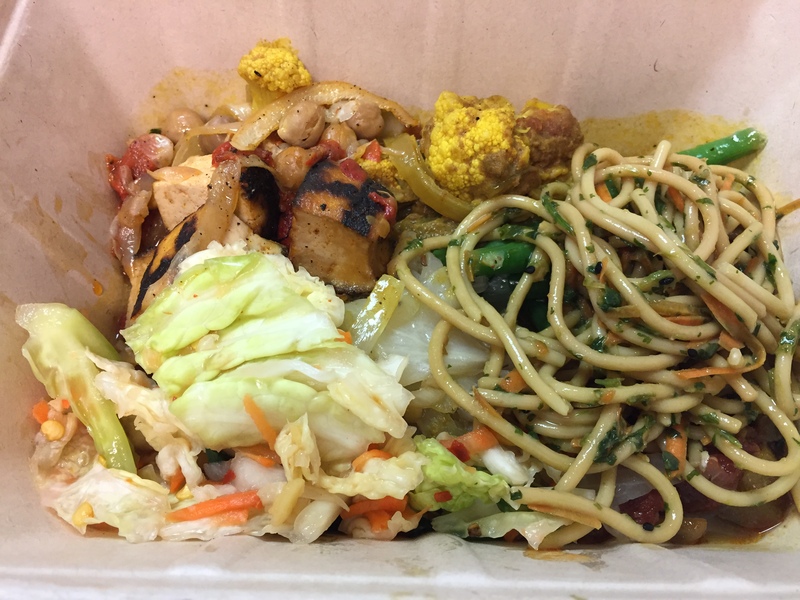 A lunch from the Whole Foods hot bar! Kim chi cabbage, curried cauliflower, curried grilled tofu, Asian noodle salad, green beans, and buried under it all is a giant heap of Bavarian cabbage and stewed okra and tomatoes. 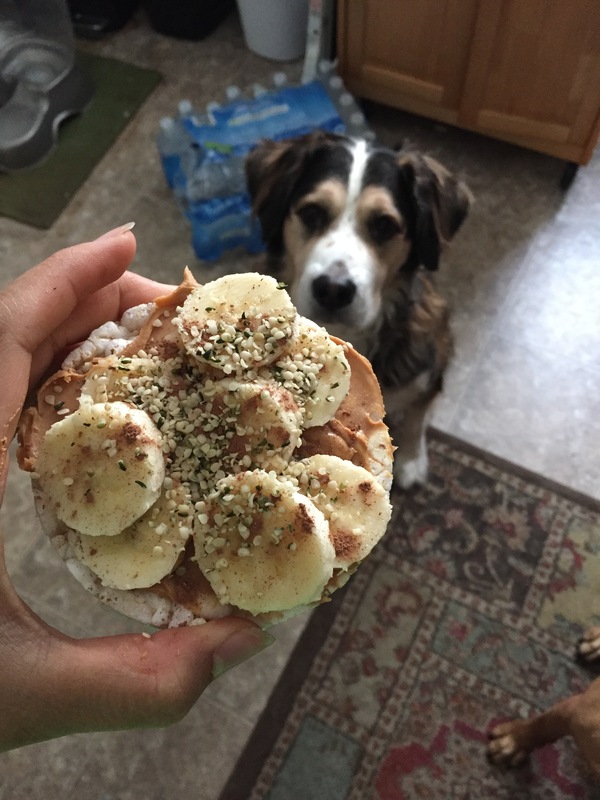 After-work snack – rice cake with peanut butter, banana, and hemp seeds! All with a begging, doggie face as per usual! 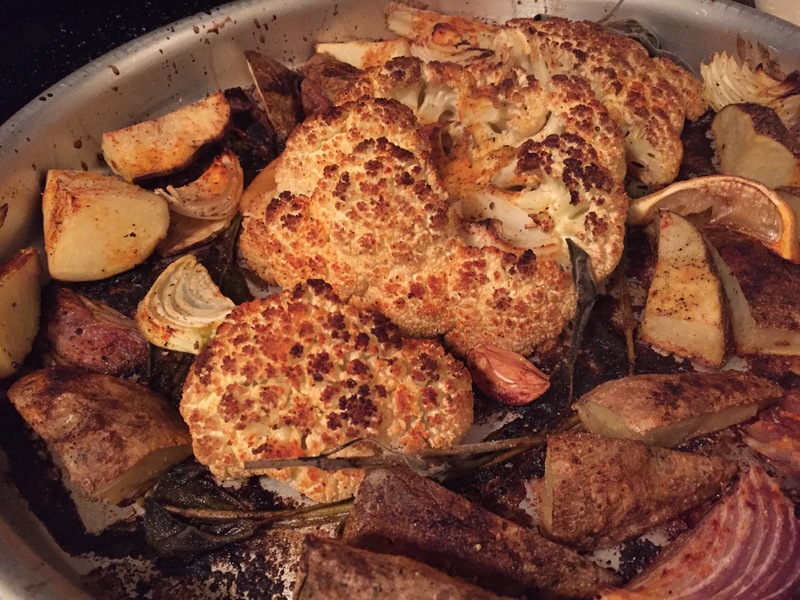 Roasted cauliflower with potatoes, lemon, sage, and red onions! 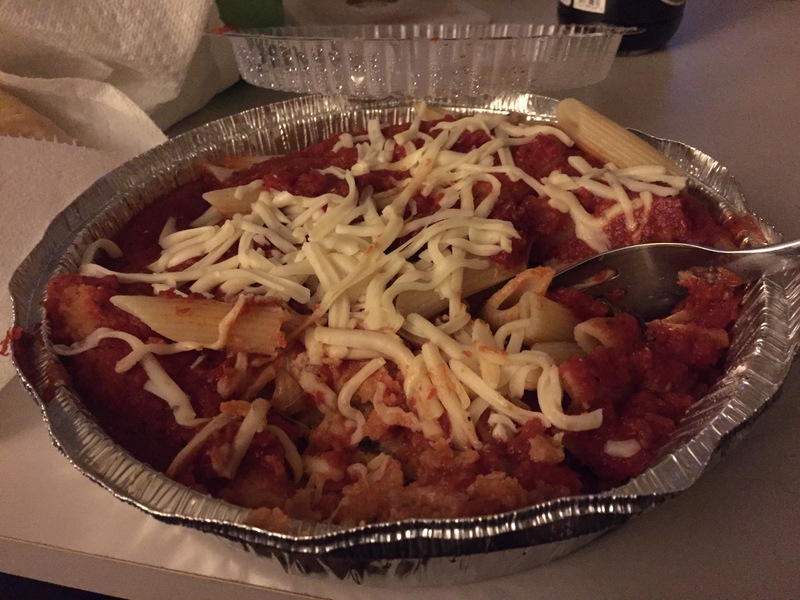 I ate this with rice and a bit of marinara on the side. 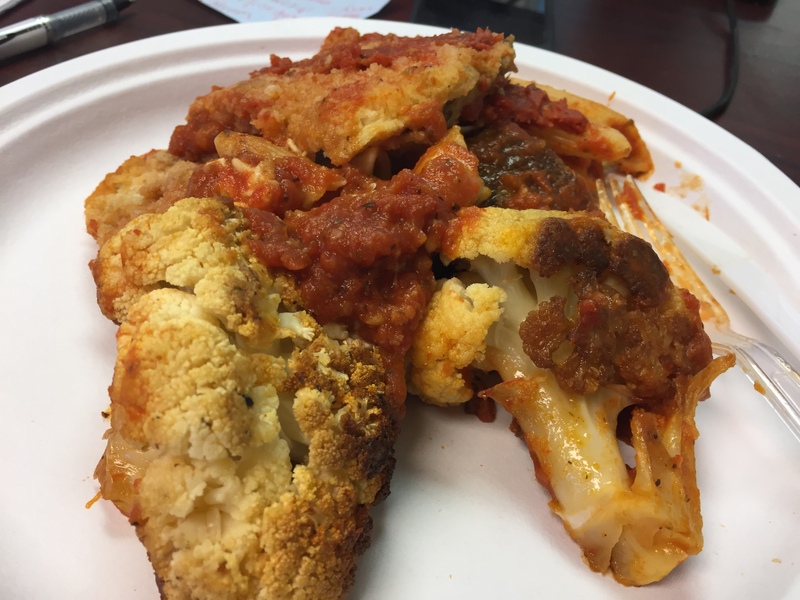 Leftover roasted cauliflower, potatoes, and eggplant parm! My usual breakfast of matcha oats, banana, almond butter, frozen blueberries, coconut, and blueberry jam! A work-snack of mangoes! Which – unfortunately, were not good at all. That’s what I get for buying out-of-season fruit. Have a wonderful, food-filled week! This was such a brilliant read, your writing has always been so soothing.